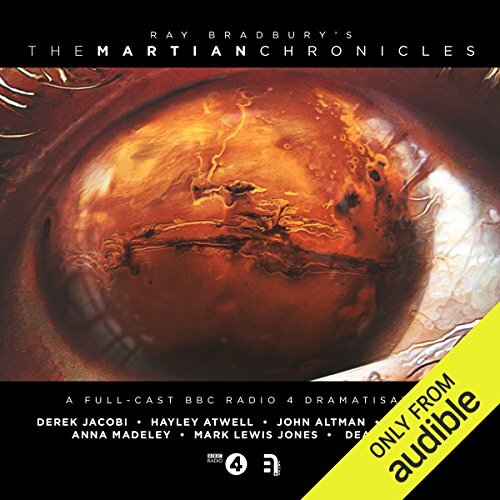 Derek Jacobi and Hayley Atwell lead an all-star cast in The Martian Chronicles, a thrilling new dramatisation reimagining Ray Bradbury’s timeless fable of doomed Martian colonisation. When the first expedition to Mars mysteriously disappears, Earth sends a second to find out what happened. But the real mission is classified. And only Captain Wilder knows the truth. Spender, an anthropologist on Wilder’s crew, attempts to prevent the colonisation that she believes will eradicate the last of an ancient people living on Mars. But to what lengths will she go? This audio release also includes a special behind-the-scenes mini documentary with interviews from the stars, plus six special teasers examining the Martian culture! I will start by stating that the performance and scoring were excellent. However, as a Bradbury fan and a fan of this book in particular, I was deeply disappointed in the story. While I understand the challenges associated with adapting a collection of short stories, this particular narrative was badly stripped of any real trace of the original author. I wish I had paid attention to the shortness of the listening time, so I wouldn't have been so shocked by the absence of the best stories in the collection. This production is entertaining enough, but falls short of capturing the spirit and poetry of Bradbury's work. Attempts to bring it up to date-- turning a male character into a female, for example-- don't actually detract from the story, but don't add anything, either. For the price, however, it's worth buying. An exquisite retelling of a sci-fi classic. Thankfully the human drama is the shining star in this version. I was completely drawn in by the sound design and the stellar cast got to the heart of the story without get lost in "space babble." I will come back to this many times. What made the experience of listening to The Martian Chronicles the most enjoyable? I'm a Jacobi and Atwell fan, so having them in the same radio drama was idyllic. It needed to be a bit longer, I think. However, I've never read the book, so I'm not sure what might have been left out, but I suspect is was definitely abridged. Very few of Bradbury's books can be narrated in under an hour. They were fabulous. Jacobi always excels in every narration I've heard him perform, and it was a delight to hear Hayley Atwell put so much enthusiasm and passion into her role. Going off one of Hayley Atwell's comments at the end, I'm pretty sure Spender is supposed to be a male character, but in this drama, Hayley plays the character. So there may be some "gender-bending" if you will. I'm not adverse to it, so it didn't bother me, but it might bother fans of the original text. Overall, I found this to be a superb radio drama. odd I think is the right description. not awful but a little pointless. not one I would recommend.